The arms race just escalated to include weapons made from bhut jolokia chili peppers, which are by far the hottest pepper known to man. Peppers are rated by the Scoville scale on their hotness. The bhut jolokia pepper, primarily found in the Bangladesh and the northeastern states of India, is rated at 1,040,000 Scoville units, almost twice the strength of the second place pepper, the red savina, and up to 20 times as hot as the average jalapeÃ±o. 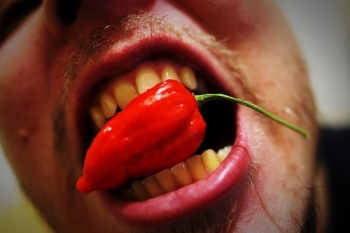 Scientists are trying to use the bhut jolokia in several practical military applications. Pepper spray is nothing new, but Indian scientists have developed a prototype of a non-toxic pepper grenade which can incapacitate mobs or possible insurgents. "The chili grenade is a non-toxic weapon and when used would force a terrorist to come out of his hideout," said RB Srivastava, the lead scientist on the project. "The effect is so pungent that it would literally choke them. "Now we are perfecting the design and once that happens, we will start production," said Srivastava. "Its pungent smell will force the target victim to throw up and the eyes will burn like hell, but all without any long-term damage. "It will immobilise them but not kill them," he said. While the grenade is the most promising, the team is also working on other uses for the bhut jolokia. "There are other applications as well, what we call women power," Srivastava added. "A specially made chilli powder could act as a tool for women to keep away anti-socials and work in this regard is also on[going]." Let that be a warning to all of you anti-socials out there! Then there's the wildlife they have to keep away. "The chili paste could also act as a major repellent against wild elephants," Srivastava said. Despite its heat, the bhut jolokia is used in small quantities to enhance curry dishes, but sometimes its heat is undetectable by humans. Last year, one young woman, Anandita Dutta Tamuly ate 51 bhut jolokias in two minutes before a crowd to set a record. But she may be one of the few people who genetically can't detect the capsaicin that provides food with its heat. Good thing she's not anti-social!